Summertime has always been synonymous to beach time. We always gravitate to the rolling waves of the sea to ease the heat of the summer sun. In the Philippines, there are thousands of beaches locals and visitors can enjoy. However, there are times when we want to experience something else other than the sand and the sea. The beach can get too crowded sometimes, especially during the weekends. So how about enjoying another body of water? 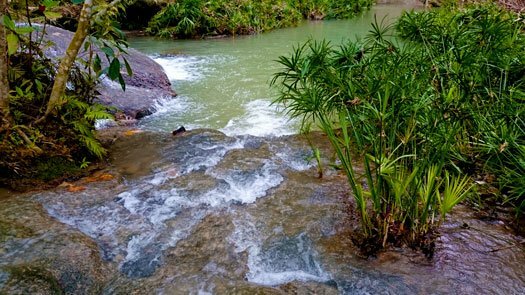 There are no lakes in close to Davao City. But there are a good number of waterfalls. Peaceful streams running downhill to the Hagimit Falls. 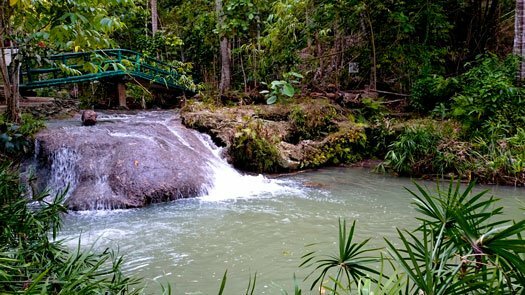 Hagimit Falls is one of the most popular attractions on Samal Island. The resort island is known for its multitude of pocket beaches owned by resorts. 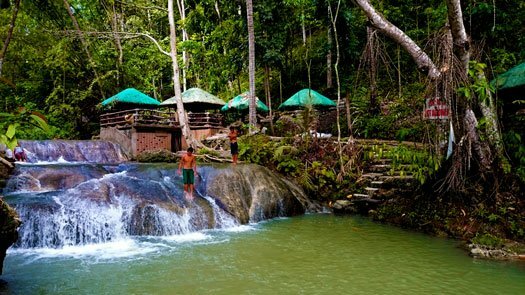 But Samal is also home to a few inland attractions that are worth visiting. 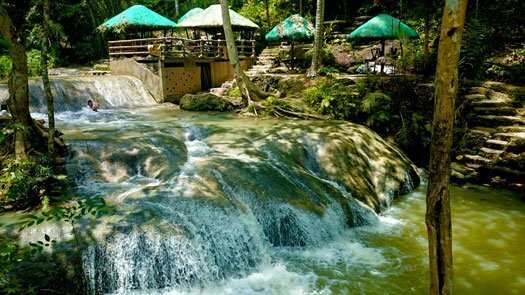 If the beach heat is too hot, the cool waters of Hagimit Falls are the perfect alternative. Plus the canopy of trees provides a much-needed shade. The waterfalls are not high and the water in the pools are cool. Samal Island is less than 15 minutes from Davao City by ferry. If you have a private vehicle, you can cross the gulf via the ferry and drive to Hagimit Falls located in Penaplata. The municipality is less than an hour’s ride from the ferry port; passing through well-paved roads lined with towering trees. The entrance to the waterfalls area. Fee: P40 for adults, P20 for kids. If you’re commuting, you can hire a tricycle for at least P300 per way. It is best to travel with a group so you can split expenses. You may also arrange for the same trike to pick you up in the afternoon or the next day. There are also some stationed at the gate, waiting for passengers. There is a bit of a hike from the gate to the actual waterfalls via a concrete stairway. It is quite steep so be sure to hold on to the railings and assist young children if traveling with. You can already hear the rushing sound of the waterfalls and the squeals of children diving into the cool pools as you descend. A small waterfall with a deep pool. Hagimit Falls is actually clusters of waterfalls. There are a good number of waterfall clusters found in the area. Some are suitable for small children while some are strictly for adults. The waterfalls’ drop is not at all high, perhaps just five feet but the pools are deep in some places. It is best to stick to areas marked as safe for kids. The water of Hagimit Falls is cool and relaxing. It also helps that the surrounding trees provide shade. It is perfect for when you want to enjoy the water without getting sunburn. It is also a great place to commune with nature. The rush of the water is very relaxing. 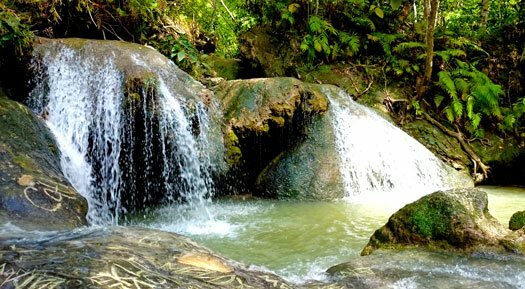 Hagimit Falls is relatively still untouched but the locals have added a few cottages for visitors’ use. For P300, visitors can rent an open nipa cottage that can accommodate at most eight people. The cottage also comes with a table and a grill you can use. Cottages are located right by the water. 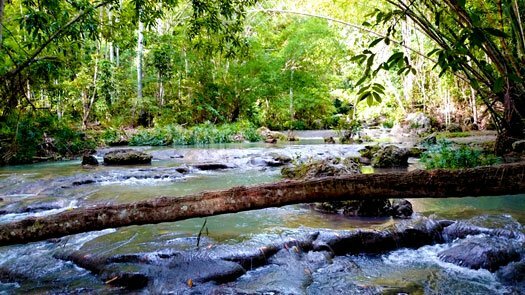 Those who wish to stay overnight can pitch a tent or stay in one of the few closed cottages (P1000 per night). Camping is a popular activity in Hagimit; during weekends, there are plenty of teenagers camped right by the water. If you want to go this route, make sure you bring your own source of light; electricity in this part is not that reliable. Also, bring insect repellant; I’ve seen humongous mosquitoes during our visit. Diving is allowed in some places. 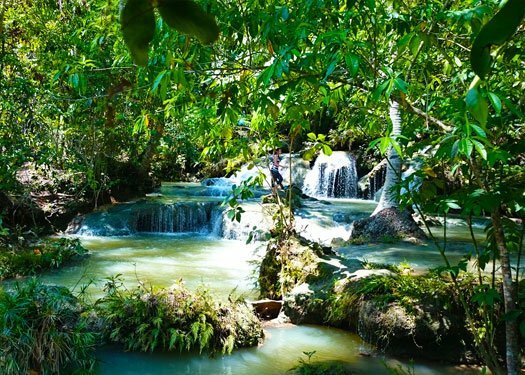 Insider tips: I recommend going to Hagimit Falls on a week day. It can get a little too crowded during weekends and the cool pools become coveted pieces of real estate. Bring as much food as you want too! There’s no corkage but soft drinks are quite expensive of you buy on site. 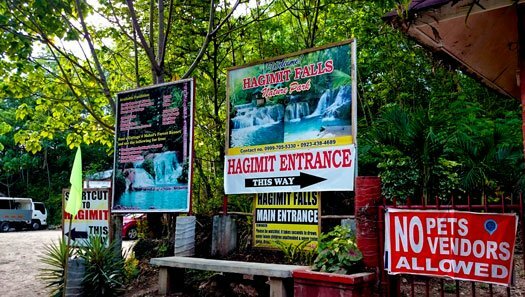 Downloadable Resources: For a closer look at Hagimit Falls, Philippine Traveler has prepared a photo review for you. The Hagimit Falls Review is available as a free PDF download or free Powerpoint download. Enjoy this review at your leisure or share it with a friend!